Hombre tigre, leyenda muy difundida en Corrientes, Misiones y Paraguay. a sus compañeros u otras personas. Cuando les viene el mal propósito se alejan de sus semejantes y se sumergen en la oscuridad de la noche, buscando el abrigo de un matorral. Allí empiezan a revolcarse de izquierda a derecha sobre un cuero de jaguar, rezando un credo al revés mientras cambian de aspecto. Salen entonces de caza, y ya devorada la presa, retoman a su forma primitiva, realizando la misma operación, pero ahora en sentido inverso. Man tiger, legend very diffused in Corrientes, Missions and Paraguay. to their partners or other people. When he/she comes them the bad purpose they move away from their fellow men and they dive in the darkness of the night, looking for the coat of a heath. 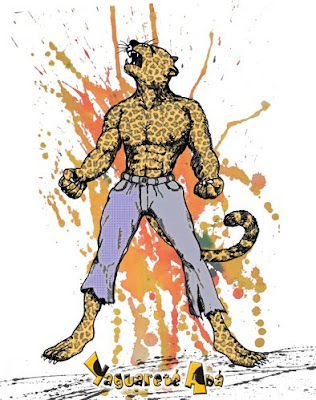 There they begin to flail from left to right on a jaguar leather, praying a credo the other way around while they change aspect. They leave hunt then, and already devoured the prey, they recapture to their primitive form, carrying out the same operation, but now in inverse sense.